TWO TERRORIST attacks hit the southern Philippines in the final days of January. The first, a double bombing at a Roman Catholic church on January 27th, killed at least 20 people. A fews days later, an attack on a mosque claimed the lives of two Muslim religious leaders. Islamic State quickly claimed responsibility for the first attack, but the perpetrators of the latter remain unknown. These recent attacks are representative of a broader trend. 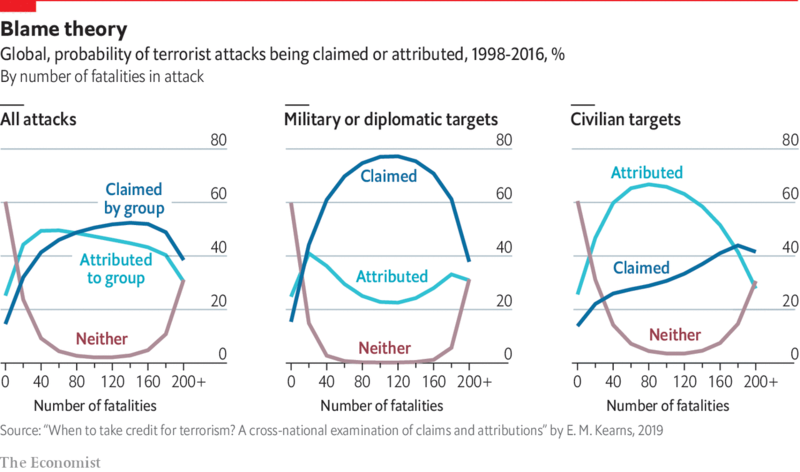 In the past two decades, fewer than half of all terrorist attacks have been either claimed by their perpetrators or convincingly attributed by governments to specific terrorist groups. A forthcoming paper by Erin Kearns of the University of Alabama, covering 102,914 attacks committed in 160 countries between 1998 and 2016, reveals a consistent pattern to these claims and attributions. Her study shows that attacks causing few deaths, like the assault on the Philippine mosque, tend to remain anonymous. But very deadly ones, such as the attack on a Nepalese military base killing at least 170 soldiers in 2002, are also less likely than average to be claimed or attributed—particularly when aimed at a military or diplomatic target. Instead, it is those in the middle, causing around 100 deaths, whose perpetrators are most often identified. What might account for this reverse U-shaped relationship? At one end of the spectrum, terrorist groups have little incentive to claim minor acts of violence. Their opponents could consider such attacks a failure, executed by an incompetent group. At the other, terrorists who inflict the most carnage might fear a backlash from the government or the local population. While killing just a few may be considered tolerable, extremely savage attacks might threaten the group’s survival. This relationship also holds for attributions by governments. In the absence of fatalities, the state faces less pressure to invest resources into an investigation. After brutal attacks, a government has greater incentives to find those responsible—but only up to a point. Very large-scale attacks are rare, and almost always occur in countries that are poor and authoritarian. Governments in these countries are often less able to investigate attacks, or have no desire to identify the perpetrators.